The popularity of water sports grows year on year with many coastal areas setting up water sport clubs and lessons. Around the world people take up some kind of water sport to try out something new and exciting. Watersports cover a huge range of activities from canoeing and sailing to jet skiing and windsurfing. These sports are hugely popular, especially around the warmer seasons. And this is why so many people, young and old, take up one of the many options in water sporting. Water sports provide people with excellent benefits such improved fitness, a hobby and a chance to meet new people. Depending on the water sport chosen, it is usually taken up via a club or lesson. 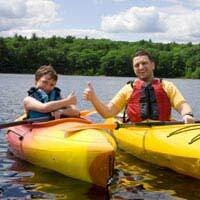 These clubs and lessons provide all the skills and knowledge needed to participate in a chosen water sport safely and correctly. With many clubs, societies and groups it can be quite frightening, especially when facing a challenging water sport. However, everyone is welcome to join regardless of their experience and will enjoy helpful instructions to get you comfortable and confident, or on, the water. Some clubs incorporate ice breaker games into water sports to put people at ease, encourage safety and help people come acquainted with their chosen activity. This ice breaker game is aimed at canoeists but can be adapted to other raft water sports such as sailing or kayaking. For this ice breaker game you will need a visible marker in the water at a reasonable and safe distance from the starting point and a set of two-man canoes – make sure you have enough for everyone. Ask the group to split into pairs. Then provide them with a two-man canoe. Explain to the group that the object of the game is to canoe around the marker in the water and back to the starting point. This is a very simple ice breaker game and is essentially a race but the benefits of this are excellent. For example, each pair have to work together to get around the marker, they also require good communication and encouragement. This game also adds a fun competitive edge, which always gets the group morale up. To make this more interesting keep swapping the pairs around so everyone in the group gets to know each other. This is an excellent trust based ice breaker game and encourages team work. This can be played in a number of water based situations with or without equipment. For this example we will use a kayak. Place some obstacles in the water for people to manoeuvre through. Split the group into pairs and provide each pair with a kayak. Explain that one of them will get into the kayak and will then be blind folded. The idea of this ice breaker game is to guide the person in the kayak around the obstacles to the other end with simple instructions. This is an effective team building ice breaker game that gets everyone motivated.